After spending around six months planning out and making models for a new and exiting animation music video for a Louis XIV song, we have binned it and are starting again. This time though, with a much better song. It's going to be a stop motion video with all the models and set we have made. Its going to be quite dark, but hopefully fitting with the song. Will be finished by the end of August. 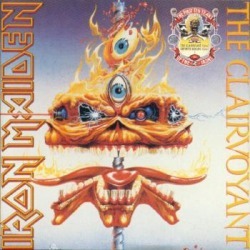 We have finished planning our video for the Iron Maiden song 'The Clairvoyant'. Its about a fortune teller who gets killed by one of his customers.